Located in the Northern Wasatch adjacent to Huntsville, Utah; Snowbasin has been a proud member of WBR since the early 1990’s. The Snowbasin Avalanche Rescue Dog Program has been an amazing resource for avalanche safety and awareness within the winter community. Snowbasin WBR members and dog teams are proud to partner with the Weber County Sheriff Search and Rescue Team to provide effective response outside of the ski area boundary. 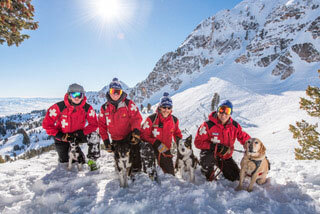 As of the 2018-2019 season, Snowbasin has 2 Level “A” certified dog teams, 2 dog teams working towards Level “A” certification, and 1 “Candidate” dog team. Snowbasin is an active participant within WBR, taking advantage of training opportunities and hosting at least one monthly training each year. We are thankful for our membership within WBR, and look forward to the future of avalanche rescue and education in the Wasatch.